My second Color Affection shawl, which shall hereafter be known as "the Bertie Bassett shawl" is done but not yet blocked so I'll save a detailed Ta-dah for Tuesday's Knitalong update when I'll compare and contrast it with my first one. Today I will take the opportunity to tell you about something that has revolutionised my blogging over the last couple of weeks. I feel I should admit that I'm a scatter-brain, one of those people who will walk into a room and forget why they are there...several times a day. It's worse after having two children, but if I'm honest I have always been this way. It doesn't help that I have lots of ideas - they flash in and out of my head at speed.... and are often gone again before being fully acknowledged or thought through. (In my professional life I got around this by continuously scribbling in a huge Filofax, and surrounding myself with talented people I could 'download' things to - they were what Belbin would have categorised as the Implementers and Completer Finishers. As a stay-at-home Mum, the Filofax is long gone and the majority of ideas I have are as likely to come to fruition as I am to look good in a skimpy bikini.) Blogging is not much different - I often have ideas for this blog or elsewhere, but by the time I'm in front of the laptop with the chance to write, they are long gone. 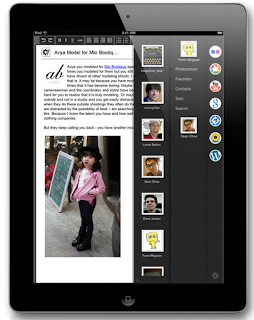 Enter Blogsy for iPad! I came across Blogsy on one of the blogs I follow (you guessed it, I've forgotten which one!) and thought it would be worth looking again at blogging apps, which have so far failed to impress me. This one is quite different to anything I've used or considered before - mainly because media is so easily integrated - you can drag and drop images, videos and web content with incredible ease. It's very simple and intuitive to use (with lots of how-to videos) and supports many different blogging platforms. Plus in moments of complete numptiness, when you can't do something that's actually very easy, the support is superb - I had a (stupid) query and it was answered in less than 5 minutes - that's the kind of service I like! I usually have my iPad to hand, so I'm now prepared for those random ideas, whenever they strike. Since I've had the app, I think all of my posts have been drafted using Blogsy and most posted entirely from the app, as formatting is a doddle. In fact, as I exclusively use an iPhone camera, my photos are automatically in my iCloud Photostream and are ready to 'drag and drop' with less fuss than using the laptop - I prefer Blogsy for picture-heavy posts. I've never had so many draft posts ready to use or expand on, and that alone is well-worth worth £2.99. If you have a blog and an iPad, I'd recommend taking a look. Today's links are Blogsy & Tami's FO Friday. Someday, perhaps I'll get a tablet, or a reader, or a smart phone....but...truthfully I hate the small screens. I bought a larger sized screen here for my computer, and don't really even enjoy using a laptop except when we're out of town and I use hubby's for a short while. Suppose it's the way of the future and I'll have to adjust...somehow. I just find those tiny screen very hard on these older eyes. Love the colors of the shawl...will be anxious to see it. I still love the colours in the shawl - they are defintely liquorice allsorts colours! I have to admit, I'm very scatterbrained too, so I have lists on pieces of paper everywhere! I think that's why I enjoy the Year of Projects so much, lol. Your shawl looks beatiful. I'm looking forward to seeing it in comparison with your first one. Then I can tell which one I like better. Could be a tough decision. Too bad I don't have an Ipad, looks like something I could use too! Can't wait to see the shawl in all its glory. Thanks for the Blogsy link, have bought it and will give it a try. I would really love to be able to blog from my IPad. What a great idea! Mahalo for the rec and 411. I love your picture, licorice all-sorts.....yummy!! I have nominated you for a Sunshine Award (more info on my Blog). 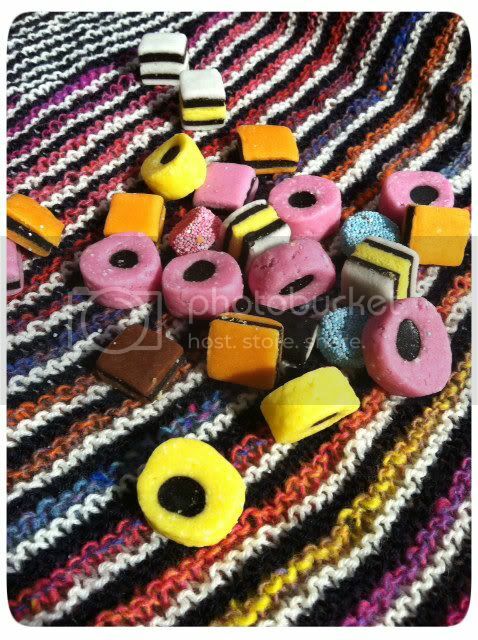 Hah your shawl is a perfect colour match for the liquorice allsorts! I never was a fan of those big round ones covered in coconut though. Always preferred the pink and blue ones with the bobbly bits on. When I eventually get an iPad of my own, I will definitely be on the look out for blogging apps that work! Not really worth it for just the iPhone though, the screen is too small, and I think Jamie would be upset if I kept stealing his to blog from when I have my laptop to hand all of the time! One day, when I have an ipad, I will definitely take a look at that. It looks very workable.